We travelled to Berlin by bus from Warsaw, Poland and it has to be said the Polski bus company were terrible. From the moment we arrived at the bus station in Warsaw, the service was at best non existent, at worst rude. We had booked online with Flixbus, unaware that the service is operated by Polski bus. Be warned if you do not book direct with Polski bus you will be required to move seats at every stop for passengers who have booked direct with the company and the staff will treat you as second class passengers. It was also a really uncomfortable bus without any of the amenities, like comfortable seats, provided on the Ecolines buses we had travelled on in Estonia, Latvia or Lithuania. Needless to say we were not the only unimpressed non Polish passengers. It is fair to say when we arrived in Berlin we were a couple of tired, cranky and bloody hungry koalas. Another issue with the bus trip from Warsaw, the driver did not once indicate how long a stop would be, meaning no jumping off to grab a snack or indeed a meal, it seemed the stops were long enough for him to have a cigarette and that was it. The trip was 9 hours, not one toilet or snack stop in that time. Now, maybe it was the tired hungrys or maybe it was unrealistic stereotyping, but we had expected to arrive in Berlin and be greeted with German efficiency on the U-Bahn. Well this was not so and we were a bit disappointed to find that the signage at the bus station did not in fact lead us to the metro system. What, no signage? In Germany? This was clearly a surprise to a few German passengers too and we wandered around for a good half an hour before someone located the metro station and we traipsed off behind them. Once in the metro system, the aforementioned efficiency was obvious. 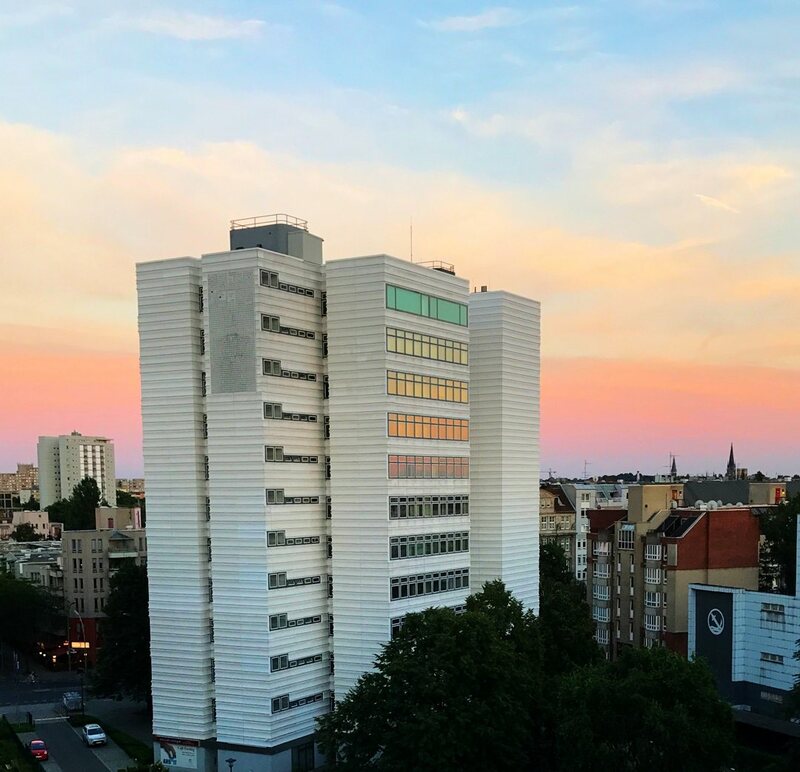 If you have been following along with our travels, you would know that we are dedicated users of AirBnb but it was a pretty expensive affair in Berlin and as we were only staying for the weekend we had booked an apartment hotel. We loved the Mondrian Suites from the moment we walked into the courtyard garden area. The staff were friendly and helpful, the rooms large and all have a balcony with great views over the city. Fortified with a large breakfast the next morning, we were up and away early to pack as many sights in as we could. As usual we were keen to walk after spending most of the previous day on a bus with no opportunity to exercise at all. 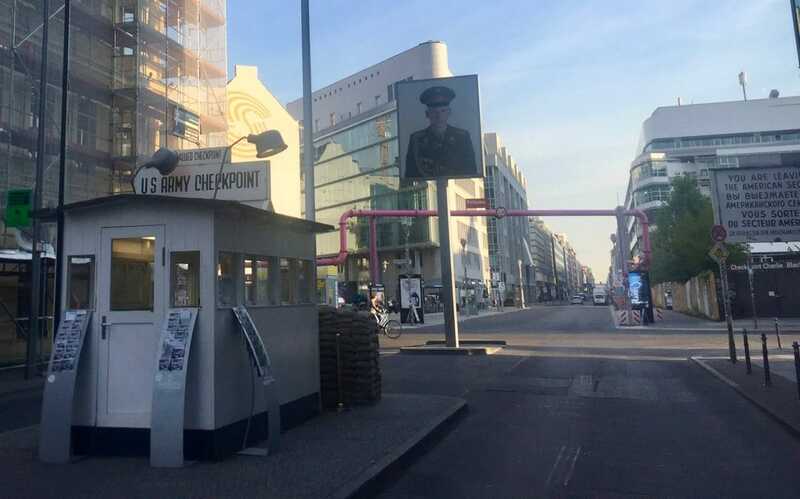 The first stop was 5 minutes from the apartment, Checkpoint Charlie. We attempted to capture a couple of photos but it is a really busy area and it is almost impossible to get a photo without someone putting their selfie stick in your face. It is times like this when one could happily strangle the SS (Selfie Stickers). We resorted to taking photos at the cafe nearby, as a record of our visit. Little did we know that our early start the next morning would provide us with the opportunity to visit without another soul in the street. There is a tip: get up early! The checkpoint itself is a simple wooden guardbox, with a sign warning that you are leaving the American Sector. Supposedly representing the original and bedecked with explanatory leaflets in many languages, it is uninspiring; the history however keeps one interested. 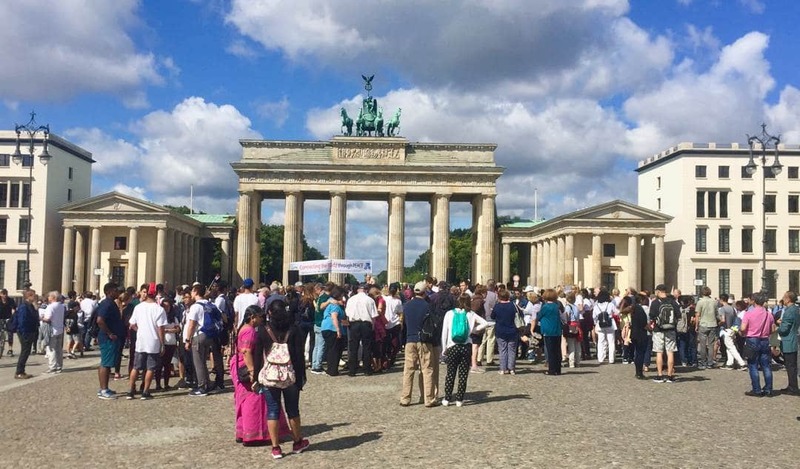 It was a fascinating and pleasant 15 minute walk to our next stop, the Brandenburg Gate. 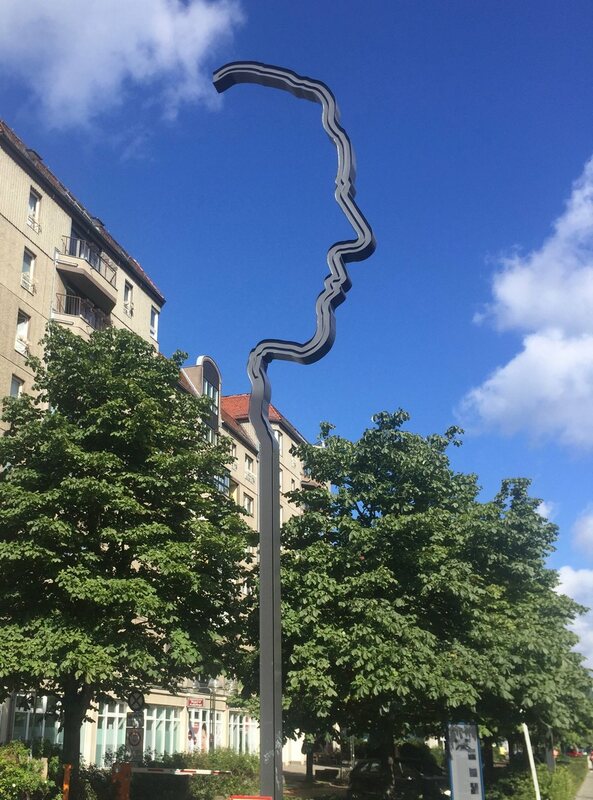 Berlin is renowned as an avant-garde mecca and there are sculptures and installations dotted through out the streets. It is worth a short stop to check out the Berlin Phone Booth Memorial Park and get a photo of the cute little vintage phone booths. The Gate itself is impressive, as is the sense of history; so many scenes from WW2 played out there. The presence of Hitler was an almost tangible thing as we strolled past plaques pointing out places where the Third Reich had conducted various operations, or where the man himself had lived and worked. It left us feeling uneasy, but at the same time fortunate that this horror had been put down. The Germans are still testy about the subject, as we heard that a week earlier two tourists had been arrested for doing the Hitler salute. Good Oh!! It is a short stroll through the Gate to the Reichstag building, the home of the German Parliament and an impressive piece of architecture. If you are heading to Berlin, be sure to walk along the park track to the Reichstag, as it is much nicer than walking with the busy traffic as google maps will try to make you do. We had hoped to visit the dome, which reputedly has the best view of the city but we had not pre-booked and security was very high. 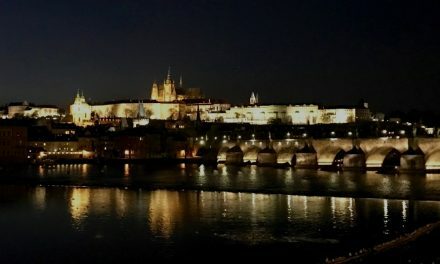 It is understandable that security is high in European cities at this time but not really conducive to tourists with unplanned itineraries (us). We joined the line at the visitors centre to get a ticket but not having done our research properly were unable to do so as we did not have our passports with us. Ian eventually managed to make a request on the website and we were hopeful of visiting the next day. The next stop on our itinerary was The East Side Gallery, which was just too far to walk so we jumped on the U-Bahn and were there in no time at all. There is a notable difference as you enter the former East Berlin, it seems edgier and street art adorns nearly every wall. In truth some of it is straight out graffiti and in our humble opinions is not that interesting but others are truly magnificent works of art. The Eastside Gallery is a memorial to peace and to those who lost their lives trying to defect from the East German state. It is painted on some of the existing sections of the Berlin Wall, beside the River Spree. It is a wonderful, free, outdoor art gallery and a must not miss activity on any visit to Berlin. Showing extraordinary patience, Ian waited for the SS to move on before capturing an image of as many of the artworks as possible, which he has since created a video and music with. You can view the video and read more about our visit to the Wall here. We found ourselves in Görlitzer Park, whilst looking for the U-Bahn station and decided it was time to join the Berliners in enjoying the gorgeous sunny afternoon. So we sat and watched the crowds sun baking, playing sports and picnicking while we digested some of the sights we had taken in so far. Eventually we wended our way home, where we enjoyed a home cooked dinner and a couple of wines on the balcony. We had eschewed the famous Berlin nightlife, so that we could be up early on the last day of our weekend in Berlin. As you must have realised by now, one of the Possess the World crew is a bit of a market fiend and there was no way she was going to miss out on the coolest market in Berlin, Mauerpark. The Mauerpark market has cult status with Berliner’s and tourists alike, who come to meander amongst the hundreds of stalls, selling everything from original art work and designer pieces to second hand clothing. It is part flea market, part art show with karaoke and performance in the afternoon, cool bars and cafes throughout the day and it is worth a visit just for the people watching. We spent a good couple of hours wandering, making a few small purchases before it was time for a beer and sausage. Yes you read that right, the Berliner’s are seriously civilised about their beer and what else do you need at 11:00 on a Sunday morning but a beer to get you through the next stage of your marketing? Would you believe it, we had yet another chance to listen to an Aussie singing a few tunes in the beer garden. It seems no matter where you go in the European summer, from Riga to Berlin there will be an Aussie with a guitar! Having had our fill of markets and sausages we ambled off to complete our weekend in Berlin by visiting the Museumsinsel. 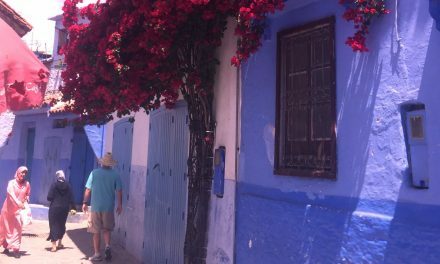 We have to admit we did not go into any of the 5 museums located on the island, mainly due to time restrictions but also because by this stage of our 12 month trip we were a bit museum fatigued. 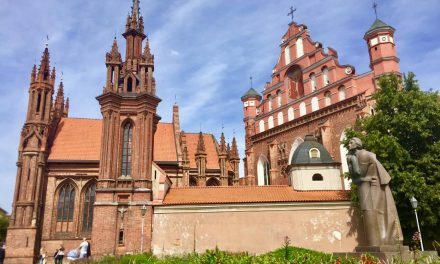 But even if you, like us decide not to go into the museums do not miss the incredible architecture in this historic part of the city. 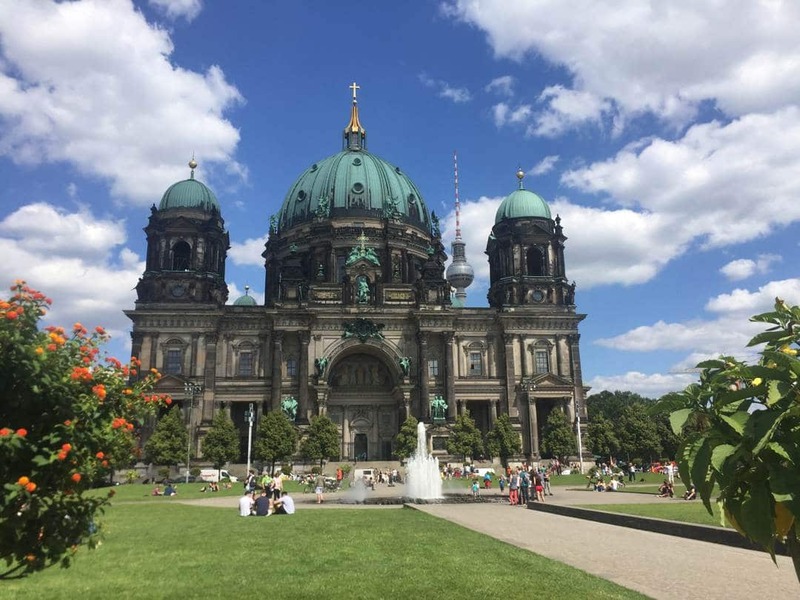 It is especially picturesque along the River Spree from the Berlin Cathedral. Also we advise you to take the opportunity to recline on the grass in the Lustgarten aan de Museumsinsel. In every city we visit we like to find a “local”, a little cafe or pub nearby our accomodation, somewhere we can talk to well, locals. Often our means of finding the local is to wander past and just drop in but in a huge city like Berlin, we often refer to the “Like a Local Guide”. Unfortunately, our choice in Berlin was, it must be said average. 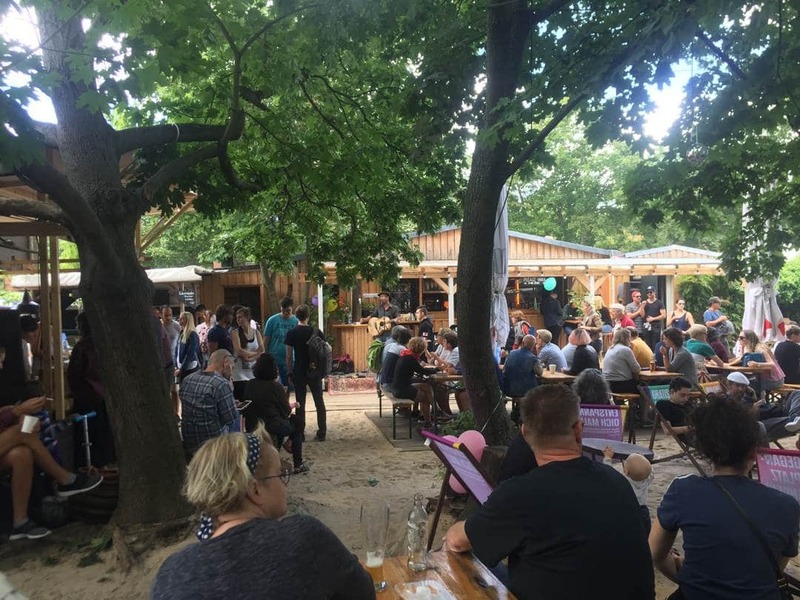 The Guide suggested that this pub, located a few blocks from our apartment was the perfect place to hang out with “real Berliner’s”, but neglected to mention that it was a mini golf centre with a beer garden/restaurant attached. There were indeed a number of families playing golf and enjoying the warm summer evening but it was a pretty shabby affair and the food, I think it can be said was less than average. Anyway you don’t travel to Germany for the food, do you? At least the beer was cold. There was nothing for it but a bit more walking to hopefully discover a more appropriate “local” which ended up being a marathon walk along the Landwehrkanal to the magnificent Tiergarten parkland. The Tiergarten is much like Central Park in New York or Hyde Park in London, within seconds of entering the vast tree lined paths, you can forget you are in the city and lose yourself in the serenity of trees, lawns, lakes and some interesting, if somewhat aggressive sculpture. We never did find that other local spot for a drink before dusk descended and it was time to head home to prepare for an early morning start on our next adventure, Utrecht. If you have found this post interesting please share on Social Media, using the buttons below or give the post a rating using the stars below. Please contact us or leave a comment if you would like more information about our travels in Berlin. Berlin has long been somewhere I want to visit! Sounds like you had quite a time getting there. I think I’ll do a bit of planning before my visit so that I can try to avoid the crowds (as much as possible). The market looks like a great place to explore and relax over a beer! Berlin is such a great place. I love this city. Thanks for sharing such an informative post about Berlin. I was in Munich last week of September to October and I plan on going back to Germany and this time will be visiting Berlin. I had a bad experience with Flixbus as well. We weren’t able to buy the ticket online so we went to the bus station to buy the tickets, we arrived 15 minutes before the departure, and we were told we have to buy the tickets directly from the bus driver. I asked why, and they told me that they can’t release more tickets because the bus is about to leave. Very disappointed at this point as we walked to the bus platform and told the driver we’re buying tickets and he was one of the rudest people I encountered. And he even charged us double the price than just buying it from the ticket station. If we’re not short on time, we were just gonna wait for the next bus. Since then, we’ve made it a point to always purchase tickets online in advance and arrive early at the bus or train station. Berlin is one destination I really want to visit one day! Too bad you had a not so good experience upon arrival but it does sound it got better after that, besides those crowds with selfie sticks! It definitely pays to wake up early, but it’s so darn hard sometimes haha. Good to know many places in Europe require reservation and passports. We’ll make sure to be prepared once we start traveling through Europe after Asia. Been to Checkpoint Charlie and some of the sites in Berlin. Interesting to see the windows to have so many colors!? You are lucky to have explore the city like a local. I always think is great to mingle with the local and get the insight information about their living. Your blog has remind me that point. Thanks for sharing your time in Berlin. I have never been here before but this posts has given me lots of ideas. It sounds like you had a nice time soaking up lots of history (once you got there that is). Sorry to hear about your terrible journey from Poland. That’s so annoying they made you keep changing seats! I like that you called out that the feeling of Hitler’s former presence made you uneasy. I’ve read a lot about visiting Berlin and this is often on my mind and nobody seems to ever mention it. I’ve never been to Berlin (or Germany OR Europe for that matter) but I’ve heard good things. Thanks for sharing your travel tales with us! I love Berlin, and had an awesome time staying here. I can’t remember it being that expensive, but it was 3 years ago, so maybe it’s changed! Love your photos too! Hi there, thanks for commenting. You have to remember we are Australian and our dollar is crap! Wow! What a comprehensive list! I was thinking of doing Berlin this coming April but opted to do Munich instead just because it was easier for the flight back to Australia. I really should add it to the list for the next European vacation. And this was hilarious….”cranky and bloody hungry koalas.” That’s putting it mildly! I just came back from Berlin & I did find this city full of recent history. I did not go to Mauerpark, thanks for sharing this destination. Hopefully next time I will have time to go! This is a great walkthrough if Berlin. It is somewhere I want to go and I’m glad you shared this very detailed itinerary. Thank you! 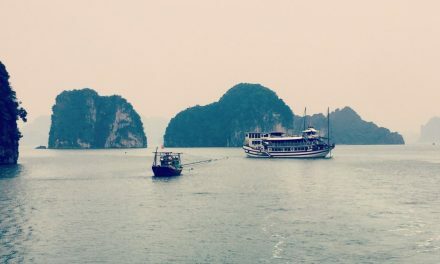 Your trip got off to a rocky start but it ended beautifully. You took some awesome pictures. My sister and her husband are in Spangdahlem Germany and I will be visiting them in the summer. Maybe we can take the train to Berlin if it not to far. I really love the looks of that market. I love outdoor markets in other countries. And the cathedral is amazing. Berlin has been somewhere I really would like to go to Berlin. 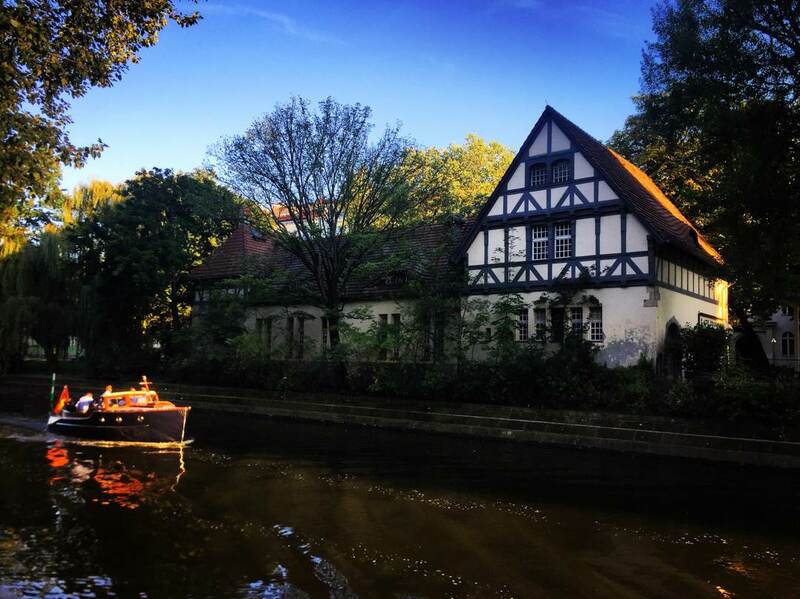 We enjoyed Germany this fall so much makes me want to explore more! Agree on the Charlie Checkpoint. But before we went over, we watched “BRIDGE OF SPIES” to get a feel of what the checkpoint signifies. Helps a little in understanding the history of this checkpoint. Hi Donovan, thanks for commenting. That is a great idea to watch a movie before visiting, we do struggle with people who visit sites without an understanding of the significance.